I would like to use a Python script that is not based on arcpy to do things like query a shapefile by attributes, create new layer from selection, and calculate areas of a polygon and convert polygons to points. Anyone have any code examples of using other Python modules or libraries? I am able to do this easily using arcpy but i wanted to explore other options. geospatial processing in Python has a very long history, much older than Arcpy (or arcgisscripting) -> no "mimic" the capabilities of ArcPy here, as Paul says, most were already there before ArcPy. you can do anything with these modules and it is often easier and faster than ArcPy because it is pure Python (no cursors...). Shapely is one of these modules for processing geospatial geometries -> calculate areas of a polygon and convert polygons to points..
You can combine all (Pysal with shapely, ...) and mix them with the other Scientific modules. - How to create a 3D shapefile from a raster? 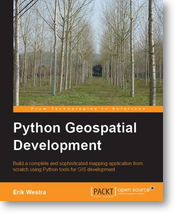 Python Geospatial Development of Eric Westra. I highly recommend the USU site Geoprocessing with Python using Open Source GIS to get you started. They primarily use the GDAL/OGR library throughout the exercises. Installing GDAL/OGR can be a bit of a challenge, so this blog entry may be helpful for you: Installing GDAL (and OGR) for Python on Windows. Also check out Alternatives to using Arcpy on GIS.SE. You might be interested in GDAL/OGR. GDAL is used for processing rasters while OGR is used for vectors. Both are open source libraries. If you are looking to remove some dependency on ArcPy, you can mimic some capabilities by reading the information to an array and running your own calculations in pure Python. I recently did this with selecting points in a polygon, as seen here. It utilizes the ray casting algorithm to determine if a point lies within a polygon, given the coordinates of the polygon's vertices. Not the answer you're looking for? Browse other questions tagged python geoprocessing or ask your own question. Is there a Guide to Translate ArcPy code to GDAL equivalent? better way to duplicate a layer using ogr in python? Translating ArcPy Commands to GDAL Equivalents? Use point shapefile to spatial query multi polygon shapefiles with Python? How to create empty polygon shapefiles with the same field names using python? Is it possible to call FME transformers (or workbenches) from my python script? Drawing map from XY coordinates in CSV and exporting it to JPEG using ArcPy? Removing polygons based on size of polygons in Python without using ArcPy?